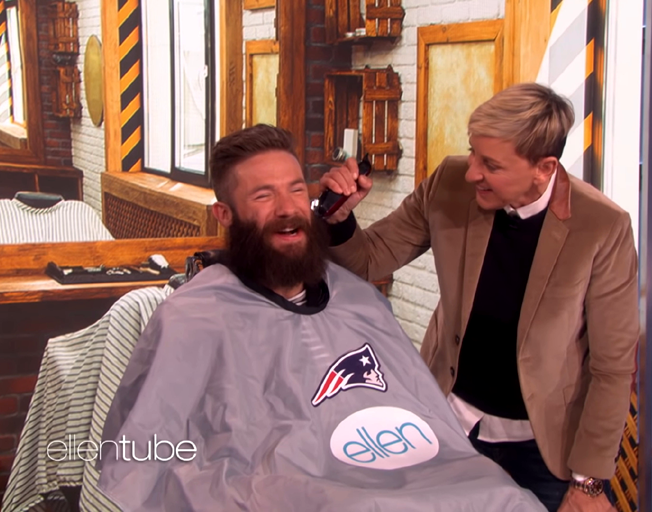 Ellen Degeneres interviewed Super Bowl LIII MVP Julian Edelman and got him to let her shave his beard for a big donation to one of his favorite charities. Ellen talked to the Julian about many things including helping the Patriots win their 6th Super Bowl Championship, being named MVP, posing naked for a magazine and more. Then Ellen asked him about his beard and wanted to know if he would let her shave it off if she donated $10,000 to one of his favorite charities, the Boys and Girls Clubs of Boston. Not only did he agree to let her shave the beard, he stated he would match her donation to give a total of $20,000 to the Boys and Girls Clubs of Boston. Super Bowl LIII MVP Julian Edelman looks very different once Ellen shaved his beard off! Watch the entire interview in the video below.